The Best of N Sale - Under $50! Morning! It's PTO Friday, and I'm a happy little camper. 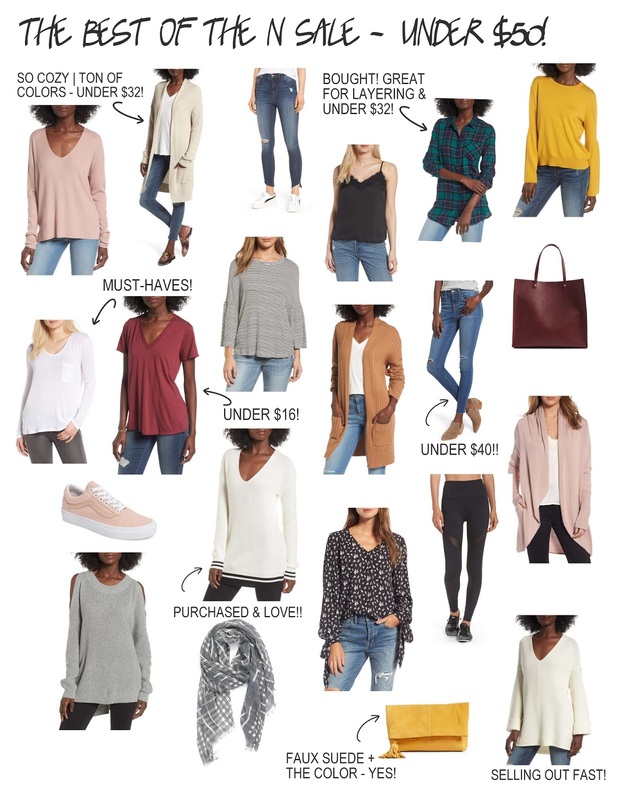 With the Nordstrom Anniversary Sale (early access) starting yesterday, I have been chomping at the bit to sit down in front of my computer and put together some great stuff for you guys. You may have seen this post on social media last night. If you're curious what was in my bag, you can get the details by clicking this link. I snagged a lot of great basics, which is no surprise for me! Seriously though, those are the ones that sell out the quickest, so I always try to get those on round one of shopping. And yes, there are multiple rounds. I don't care what anyone says - this IS the greatest sale of the year. When else are you able to snag brand new Fall pieces at a fraction of the cost? Never! My recommendation is to buy it if you like it. Stuff is already selling out (in 24 hours!) - holy crap. OH, and one more detail (its kinda huge). The Nordstrom site was down for about an hour yesterday - I mean, that is catastrophic during a time like this. Talk about stress! BUT, since we were all stressed out, and could have potentially missed out on items, Nordstrom is offering all cardholders 10X the points with every dollar spent. Y'all, Y'ALL - that's big. It's only through today though, so it's one of the better days to pack your cart pretty full. Alright, so what I'm loving so far, and all under $50! You can also click the N Sale link on my top navigation bar for more items that I like, and think would be great pieces to have. Of course, as the sale goes on, I will do specific posts for beauty, baby, shoes, etc... but for now I wanted to give a general overall feel of all the great things available. And in case you are confused on how to shop the posts via social media - here are a few tips for a stress-free experience. 1. All social media posts with items linked will have a url starting with http://liketk.it/andaspecificnumber/letterconfig. Plug that into your browser and it will take you directly to my LiketoKnow.it page where you can shop that specific look (and any other look where I've linked items). 2. You can register your email with LiketoKnow.it, and any time you 'like' a photo on social media with the @liketoknow.it tag and #liketkit information, you will get a link sent directly to your email. Click on the items in your email and it will take you directly to the page where you can purchase. 3. This is the newest, and easiest way! Download the LiketoKnow.It app in the App Store. Once you do so (and log in), you will see ALL of your likes, and they will be ready to shop. It basically just looks like an Instagram feed when you login. Click on the image that you want details on and BAM - direct links to those exact products. This includes likes from me, and any other person using the @liketoknow.it tags. It's pretty awesome! With the new release of the app as well, you can shop any photos that you have taken a screenshot of. This includes a screenshot from Instagram and Instastories directly. As long the photo has the LiketoKnow.it logo (a heart with a circle around it), its available to screenshot. I'm telling you - they have made this SO easy for everyone. And that way, you don't have to deal with yet another email. You can just check your app for your recent 'likes' and screenshots, when you feel like it. As always, I am here for questions if you have them. I would actually prefer if you guys asked me questions if you're confused, or gave me your feedback on what you want to see more of. This blog is about YOU, and I am successful because of YOU. I want to make it the best experience around. Thanks so much for always being so supportive, and allowing me to have a reason to continue this blog. Hugs, friends!